Times have certainly been challenging for the Greenville Men’s Volleyball Team. They started out strong, winning six of their first seven games. Since those first seven, however, the team has only won four out of their last nineteen games. However, the record is not necessarily indicative of the season they have had. 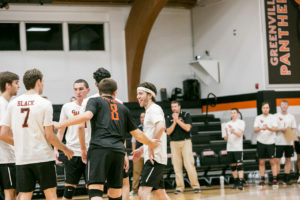 There are certainly games in which the team has competed well, but have just not been able to finish or knock multiple sets off against good teams. This year, so far, has been a moderate disappointment. The goal at the start of the year was fifteen wins. At this time, the Panthers only have ten wins with four games left. In hopes of future successes, I will be diving into some of the highlights of the season as well as some of the needed points of improvement. The highlights of this season are more in the details. If you look closely at the match stats, you will notice that Greenville generally hangs in with other talented teams. Looking at scores of games against Wittenberg, Mount St. Joe’s, Fontbonne, and North Central, the team is able to stick with the teams who are in the top half of the conference. Not only are they able to stick with them, but they are also able to take set wins from them. Pictured is Dameris digging the ball vs Fontbonne University on March 9. Media by Laurie Hannula. Another highlight is the continued development of sophomore setter, Logan Dameris. Dameris has been playing competitive volleyball for two years now, but he has developed into one of the most talented liberos in the conference. He is currently in the top five of the conference in digs with 199. He will easily pass 200 digs with four more games remaining. Look for Dameris to be a key player for the Men’s Volleyball Team within the next couple of years. 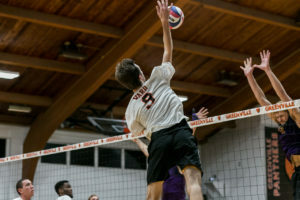 Kyle Ward, the team’s leader in kills, has also done well, especially in his transition from middle hitter to right side hitter. When Ward is on his game, there is not much stopping the 6’4″ attacker. As he continues to grow in his development as a pin hitter, we look for him to lead the court his senior year. There are a few areas of improvement that the team needs to work at in order to get to the next level. To compete for a tournament spot in this conference, a team needs to be solid at each phase of the game. The team is serviceable at each of the phases (passing, blocking, hitting, and serving), but not particularly great. The consistency is not quite there yet. Some games the passing is on point, but the kill might not be there. The next game it might be switched. 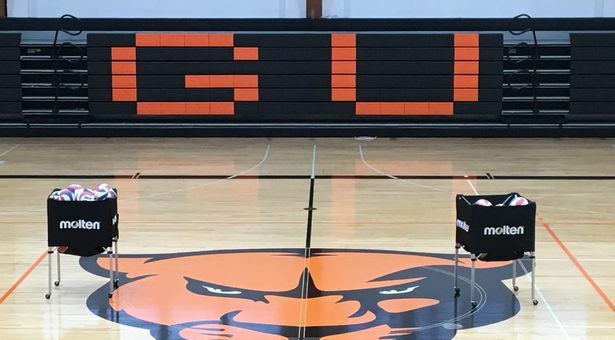 In order to make some noise in the conference next year, Greenville must improve consistency in all phases of the game. Another area of needed improvement is finishing games. Most of the time, the game is between the twelfth and sixteenth point. Once that time comes around Greenville strings together a couple of errors and puts themselves into a hole with not many points in a set. That has happened on multiple occasions this year, resulting in many lost sets. The men plan to work hard in the offseason to clean up those end of the game errors. Looking ahead, the men’s team is full of talent. These last four games are crucial to the program’s momentum heading into the offseason. In years past, Greenville has been able to finish well. They look to stick with that trend as they take on Augustana, Loras, Maranatha Baptist, and Lindenwood Belleville. All of these games are winnable. As they head into the offseason, the Panthers look to add a few more vital pieces of the puzzle to catapult them to the next level. Catch the team in action on April 6th and 7th in H.J. Long Gymnasium. Media by Laurie Hannula.